The world’s largest museum attraction is nestled in the backyard of the Ozarks. Located in Branson, Missouri right off of the strip, the Titanic Museum offers insight into the historic British cruise ship. The museum is a gorgeous replica of the luxury liner which allows visitors to stroll through the realistic hallways, see the cabins in their former glory, and experience all of the informative displays, exhibits, and artifacts. The architectural aspects of the museum are amazing. The grand staircase is a gorgeous sight to behold, and it becomes a unique centerpiece for the museum especially when decorated for the holidays. The staircase is a genuine and exact replica of the original staircase on the ship, and it cost one million dollars to create. Not only is the building beautiful, but the exhibits are great for learning more about this famous ship. These interactive displays allow guests to truly get a unique vantage point into the lives of the Titanic’s 2,224 passengers. Upon entrance into the museum’s lobby, each visitor will receive a Titanic Boarding Pass, on which the information of a real former passenger will be displayed. 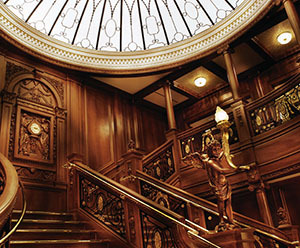 This unique twist on the museum allows guests to become a part of the Titanic’s voyage as they explore the building. Guests will be able to view more than $4.5 million dollars worth of artifacts including 400 items and countless photographs. Just a few of these gems include personal items of passengers such as handbags, jewelry, dining schedules, and authentic Titanic memorabilia like a deck chair and dishes. The crown jewel is definitely a genuine life jacket, which is one of only nine still in existence. Twenty rooms make up the museum, and the artifacts are sprinkled throughout for an interesting experience in each part of the ship. As visitors explore the cruise liner, they can also take part in many different hands-on exhibits. They will be able to touch an iceberg to feel just how cold the twenty-eight-degree North Atlantic waters were, shovel artificial coal in the Boiler Room, learn how to send an SOS signal, experience the slope of the boat as it sank with the Sloping Decks, and even sit in a full-scale replica of the lifeboats used. Patrons will even get the opportunity to steer the ship at the Interactive Bridge Area. Visitors can also view the 18-foot model of the Titanic, which was built specifically for the Branson Titanic by designer Peter Davies-Garner. Davies-Garner was inspired by the drawings of the original shipbuilders, Harland and Wolff, and the design was derived from these sketches. Other popular exhibits pay homage to the third and first class passengers with the Third Class and First Class replicas. Guests will be able to learn how much a room would cost modernly for each class as well as experience what it was like to be boarded in those rooms. 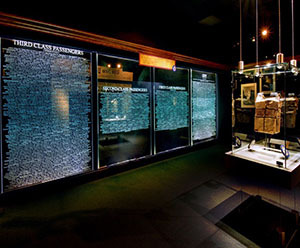 At the Survivor’s Wall of Stories, guests can learn about the 712 survivors and the details of their lives after the events. The displays are adorned with quotations from those who lived to tell the tale. One of the most notable of the survivors is Margaret Brown, who was born in Hannibal, Missouri, and aided in the evacuation of the ship. She went on to become an activist for education, literacy, and the rights of workers and women. After learning of the survivors, you will also have a chance to learn about those who lost their lives in the tragedy. Another exhibit at the Titanic Museum features the bravery of the children on the Titanic. 135 of the more than 1,500 passengers killed in the sinking were children, and the Children’s Stories Gallery gives voices to the young souls who were lost in the perilous journey. Recount their bravery in this intriguing display, which is the only one of its kind. The tour concludes with a trip to the Memorial Room, where guests will find out what happened to the passenger on their Boarding Pass. They will be able to read the names of the passengers lost in disaster. The room is a harrowing and solemn place that creates a new appreciation for the history of the ship. As well as tours, the Titanic Museum also offers different events during the seasons such as a Night at the Titanic Sleepover, the Titanic Christmas and Winter Celebration, and the Titanic Honors Veterans event where military personnel get in for free. These events help to make the Titanic Museum a place you will want to visit again and again. 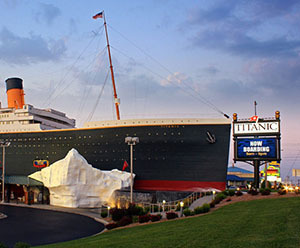 Since its opening in 2006, the Titanic Museum has remained one of the most popular attractions in the Branson area. With authentic artifacts found by owner John Joslyn in a 1987 expedition to the Titanic’s sinking site, this attraction offers a unique authenticity that has made it a renowned excursion for fans of the Titanic for years past and years to come. Visit this site to learn more about trips to the museum and to purchase tickets.